Lowertown is bounded by the Rideau River to both the north and the east. Daly-Besserer-Rideau Streets lay on the southern border, and Cumberland Avenue lies to the west. The neighbourhood includes the communities of Beausejour, Beausoleil, Charlotte, and Macdonald Manor. Originally a cedar swamp on the lower of two plateaus west of the Rideau River, it was (in contrast to Uppertown) clear cut of trees and given a grid style street layout. During the 1820s-1830s construction of the Rideau Canal created an influx of Irish immigrants, French Canadians, and Scottish stone masons. While the Scottish immigrants moved to Uppertown with the English population, the Irish and French took up residence in the more affordable Lowertown area (which included the lands on both sides of what is King Edward Avenue today). 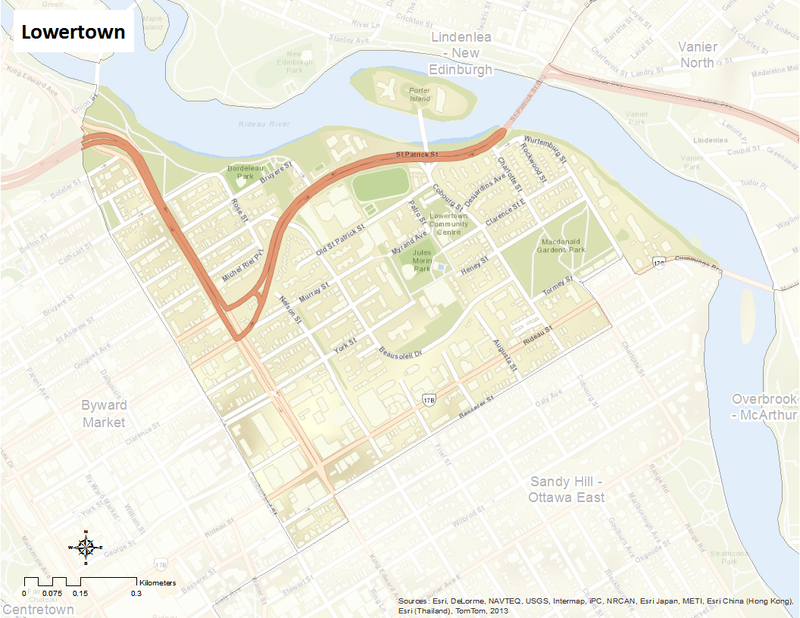 The layout of the modern Lowertown dates back to the Post-War era when a renewal and improvement plan, the Gerber Plan, was initiated in an attempt to accommodate the growing population by giving Ottawa’s downtown a more practical layout. However, as the plan included demolishing many people’s homes (as had actually occurred in Lowertown), it was halted after residents in neighbouring communities witnessed what had occurred in Lowertown.